Hideaway for the holidays in this secluded luxury villa. Stay in and laze by the pool, or if you're feeling sociable, head down to the beach for a cocktail on the white sands of Cala Saona. Whatever you choose to do, this comfortable villa can be your home away from home in Formentera. Can Stefania is 5 bedroom typical Formentera house, surrounded by native trees creating a very private and relaxing space to enjoy some time in. Relax in the swimming pool, eat gourmet food at the nearby restaurants or have a refreshing swim at the famous family friendly swimming beach known as Cala Saona. Can Stefania is an authentic charming house decorated very much in the Formentera island style with white washed walls adorned with pieces of art, relaxed seating areas with neutral decoration creating a fresh contemporary feel. It has 5 double bedrooms and 3 shower rooms, sleeping a total of 10 people. It has a fully equipped kitchen, lounge with tv, wifi internet, and air conditioning. The location of this casa is superb. There is plenty of outdoor space, with a good size swimming pool and furnished terraces. It is based within plenty of countryside & native trees for maximum privacy and just a short stroll away from the famous sandy swimming beach of Cala Saona. High standards are shown throughout and includes a regular pool & garden maintenance with house cleaning once per week. 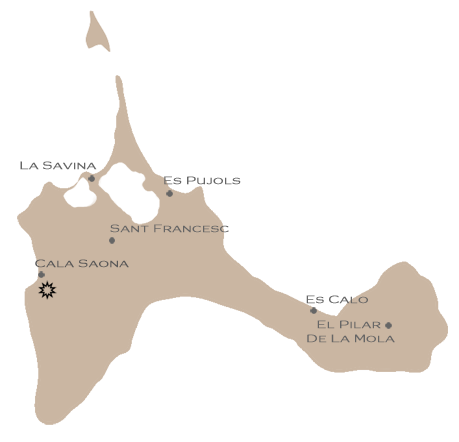 The casa is located in the area of Cala Saona. Lots of amenities are available nearby with excellent restaurants specializing in seafood and the local cuisine. You can walk to the beach 1km away. From the beach you can hire bicycles to explore the island at a more leisurely pace. The main town of Sant Fransesc is 5 minutes by car or a short cycle ride away.